3D Table Talker - ideal for clubs, bars, pubs and restaurants. Description All your 3D Lenticular Print will be sent as individual units by parcel delivery. Your 3D Lenticular Print will be sent in two separate deliveries – one by pallet, one by parcel. 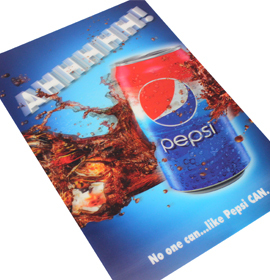 Fun and attention grabbing, lenticular print creates 3 dimensional images that demand a closer look. Printed at 100 lines per inch on 0.6mm PET, 3D print is a surprisingly low cost way to create a high quality promotion. Also, unlike other card alternatives, your unique 3D designs are protected, easy to wipe clean, and long lasting. Below are details of a few of the possibilities. Available in any size up to 245 x 345mm. The option of square-cut or custom shapes are available. 2mm non-slip foam underside with optional adhesive for more permanent placement. Available in any size and shape up to a 200 x 200mm face size. Provides double the display area and visibility of a conventional strut card, and more durable. Ideal for cafes, bars, clubs and restaurants. 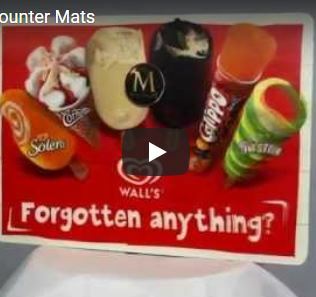 Ideal for lightboxes, poster frames, wall and window displays. Available in any size up to 585 x 792mm. Plus shelf wobblers, open/closed signs, labels and magnet mounts – to name a few.